Sold to the Crocker Art Museum, Sacramento, California. In France since at least the early 20th century. Jacopo Stoppa, Il Morazzone, Milan 2003, cat. 67, p.248-9, fig.67a, dated circa 1618. Though born in Lombardy, when still a young boy Pier Francesco Mazzucchelli’s father, a stone mason, moved the family to Rome. Morazzone, as he became known, began his career under the strong influence of the most successful Mannerist painter working there, Cavalier D’Arpino. In his mid twenties he moved back to Lombardy and settled in Milan, becoming one of the region’s most sought after painters. His Roman training brought a classicism and sophistication to his style which fused with a Counter Reformation mysticism and intensity. He specialised in painting altarpieces and frescoes for religious establishments but also produced smaller scale works on canvas for private patrons. Most famous of his public works is the extensive series of frescoes done for the Ecce Homo and Condemnations of Christ chapels on the Sacro Monte of Varallo in which he created highly illusionistic, naturalistic tableaux to be combined with Giovanni d’Enrico’s polychrome terracotta sculptures to extraordinary effect. Morazzone collaborated with Giovanni Battista Crespi and Giulio Cesare Procaccini on paintings honouring San Carlo Borromeo for the Duomo in Milan and had numerous followers amongst whom were Francesco Cairo and Isidoro Bianchi. A spectacular painter and draughtsman, he is one of the most interesting artists of the Lombard school. 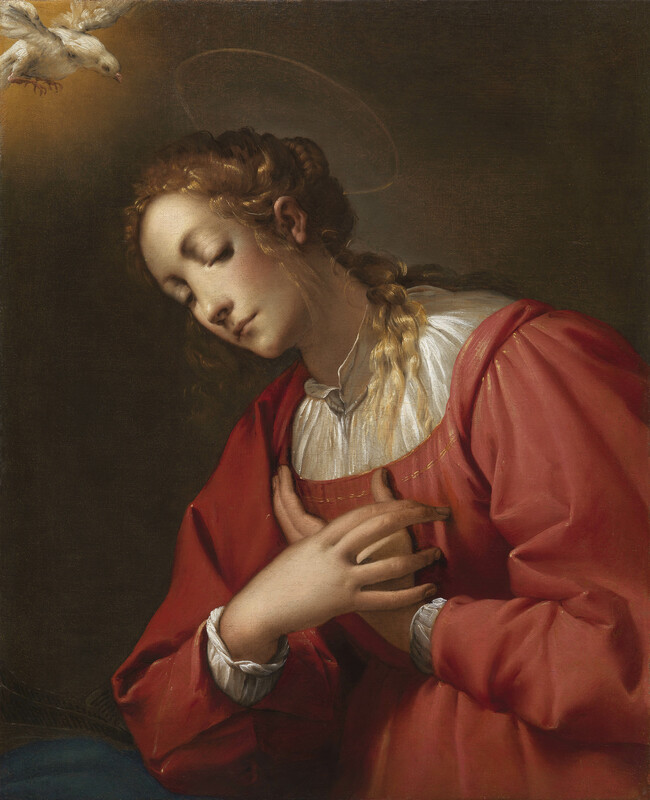 Without the benefit of seeing the painting post-resoration, Jacopo Stoppa in his analysis of the composition suggested that this Virgin Annunciate may have been cut down, originally forming part of a larger canvas or diptych. In his monograph it is published with the 19th or early 20th century additions still in place2. These additions have now been removed to reveal the dimensions of the original canvas, the bare, unpainted edges of which became visible at top and bottom edges as well as the marks of the original stretcher on all four sides. Though this discovery proves that the painting has not been cut from a larger canvas, it is still possible that Morazzone conceived of the picture as one side of a diptych or as a pendant and while the measurements and scale of the Virgin do not match, Stoppa proposed that the painting of an Angel Gabriel in the Musée Rupert de Chievres in Poitiers, a copy of a lost work by Morazzone, might be a record its pendant1. 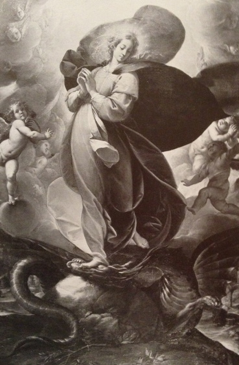 Stoppa also notes the close links in figure and facial type with another fine image of the Virgin, this time the Immaculate Conception in the Church of San Carlo in Oleggio, which he also dates to around 16183. Jacopo Stoppa, Il Morazzone, op. cit., p.271, cat.C5. (Oil on canvas, 87 x 62cms). The restoration also revealed small sections from a late 19th or early 20th century French newspaper pasted to or marking the additions suggesting a time and place for the restoration. Jacopo Stoppa, Il Morazzone, op. cit., p.247, cat.65.